What happened? Last week we had a high of about 60 something (on a good day). This week, it has been in the 90’s for days in a row. We went from early spring to mid-summer in one week. Bummer! So even though our local veggies at the market are 3 weeks behind everyone (except probably, that gal I met last week from Fairbanks, Alaska), I feel like I have to cook for July. We were on our back porch, baking in the heat, planning this week’s Sunday supper when we came to this conclusion. It’s time for rose…oh how do I put the French accent aigu over that? Rose the wine, not rose the flower. So, before we went any further preparing for our Sunday get-together, we went off to the Wine Merchant, where Kathy steered us to a few of her favorites that she brought in for this year. We walked away with 3 varieties, promising to come back for more when we decided which one we preferred. Personally, we like the French ones that have a crisp, mineral note, as opposed to the ones that folks define as “strawberry”. Back at home, I felt that I should make something to accompany this coming out party for the rose. Hmmm….OK, I’ve got it….I need to make a few of those cheese crisps that I haven’t made….well…since the last time it was hot enough for rose. Everyone wants to bake when it’s 90 degrees outside, right? Well, I have to admit that my oven does not make the kitchen any hotter than it is already, so I turned it on preheat and got started. This is a very simple, tasty, treat. It comes together in minutes and I don’t know anyone who doesn’t like to nibble on one of these while sipping a bit of rose (or just something cold). I made them two ways….some for my nut loving friends and some for those who don’t care for, or are allergic to, nuts. Either way, it’s a great start to your Sunday supper. In a bowl, add flour and pepper. Stir to mix well. Add the softened butter and grated cheese. Combine till it forms a ball. Place on lightly floured board and roll out to a little over 1/4 inch thickness. 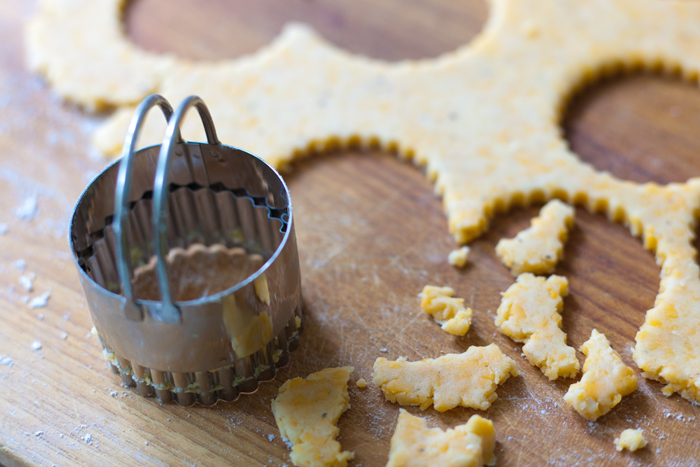 Using a small (1 1/2 inch) or (2 inch) round, cookie cutter cut out and place on ungreased cookie sheet. 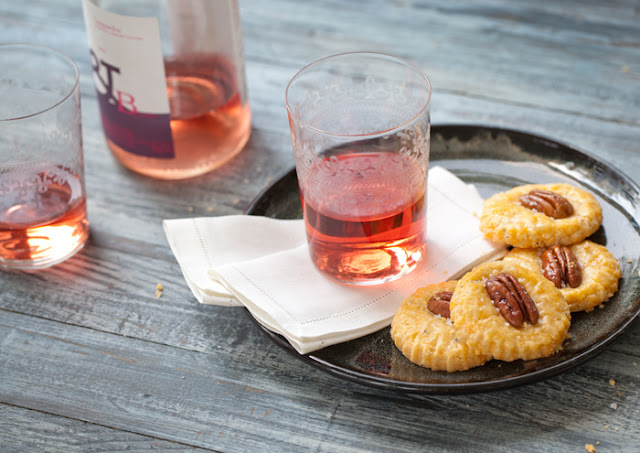 Add the pecans if you wish. Whisk the egg in a small bowl to make a wash and brush on top of the crisps and pecans. Bake for approximately 20 minutes. Place on cooling rack an immediately sprinkle with sea salt. 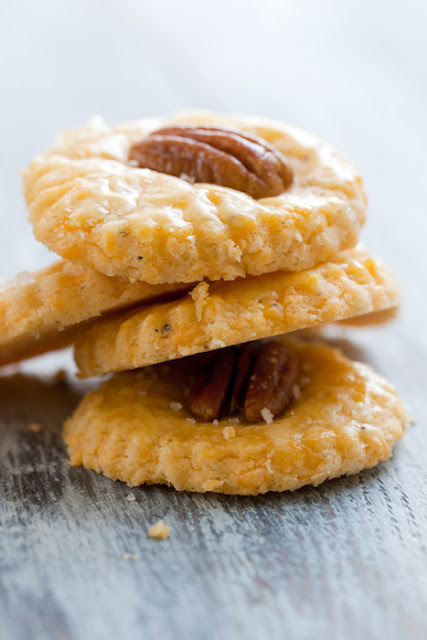 Please note: We find that we like these best when we make them a bit smaller, more of a bite sized treat, although we took pictures of the larger ones. Either way, they're tasty....just a bit more dainty when small. 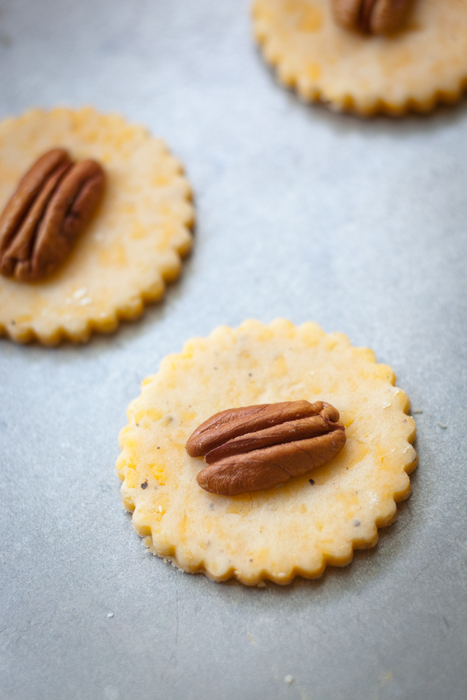 Also, you may want to consider adding 1 tablespoon finely minced rosemary for a more savory crisp! Please tune in tomorrow to the CBS Early Show! I love the addition of the pecans to the crisps. Beautiful photos as always! 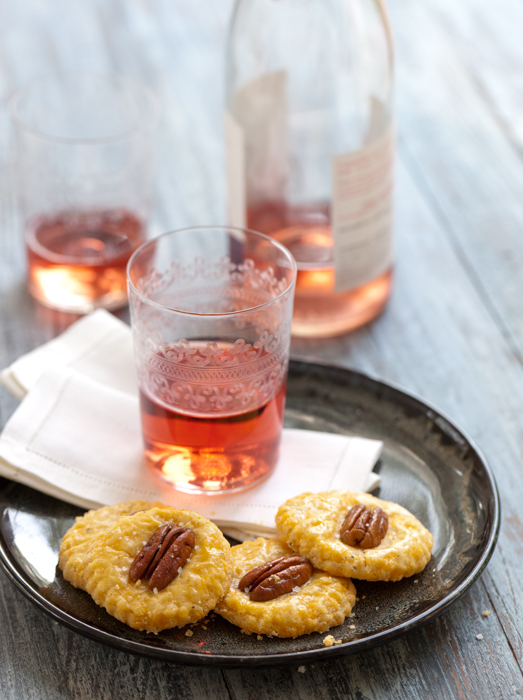 Your cheese crisps and rose wine go together nicely. Very elegant. I like it.